At a press conference today, New York City Mayor Michael Bloomberg announced that the mysterious sweet smell that has covered parts of the city sporadically over the past few years was the result of fenugreek seeds being processed at the International Frutarom Corporation plant across the Hudson River in North Bergen, NJ. Investigators located the source by mapping the time and location of odor complaints phoned into the city’s emergency hotlines. (I used a similar method last week to point the finger at Roxana, IL, as the source of the big stink inundating St. Louis.) The city’s odor map is available at Gothamist.com. I have to say that at first glance it doesn’t make a compelling visual case for a single point source. The city’s press release lacks chemical detail as well. It says the smell resulted from Frutarom “processing foenugreek [sic] seeds to produce food additives.” That’s OK as far as it goes. But in all likelihood the smell is due to one particular molecule found in fenugreek, known informally as “caramel furanone,” or more precisely as sotolone, or even more precisely (and too alarmingly for a soothing press event) as 4,5-dimethyl-3-hydroxy-2(5H)-furanone, illustrated above. Sotolone has a maple syrup-like odor and is, in fact, used to flavor artificial maple syrup. It was recently identified as the molecule responsible for the odor of maple syrup urine disease, an inherited metabolic anomaly that can be fatal. A weird form of pseudo-maple syrup urine disease was reported recently: mothers who eat fenugreek just before delivery (it’s a folk medicine for encouraging lactation, among other things) have babies that smell suspiciously like maple syrup, which throws the delivery room staff into high alert. 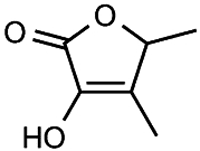 Sotolone is also a key aroma compound in soy sauce and various kinds of wine. My husband worked for Frutarom in Israel. He used to come back home with the smell of apples and concrete.